KSKS is Here and is awesome!! My KSKS arrived and it's awesome!!!! 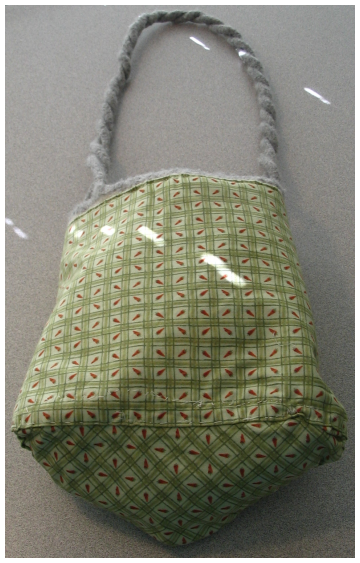 Here is the Bag: Sherry designed it herself. 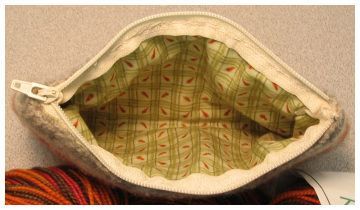 :D It has several pockets on the inside and looks like it will be wonderful for holding sock projects. 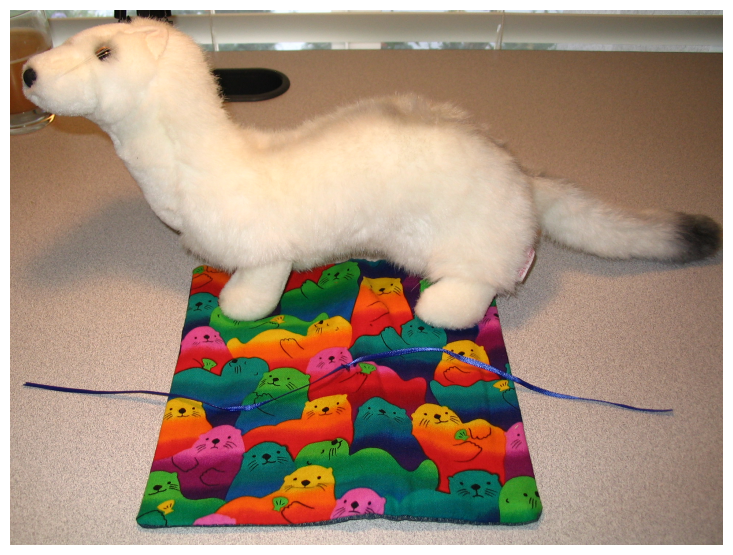 Here is a ferret she sent along to keep my kit safe and happy as well as a TOTALLY KICKASS Otter Fabric Needle case!! :D How Cool! 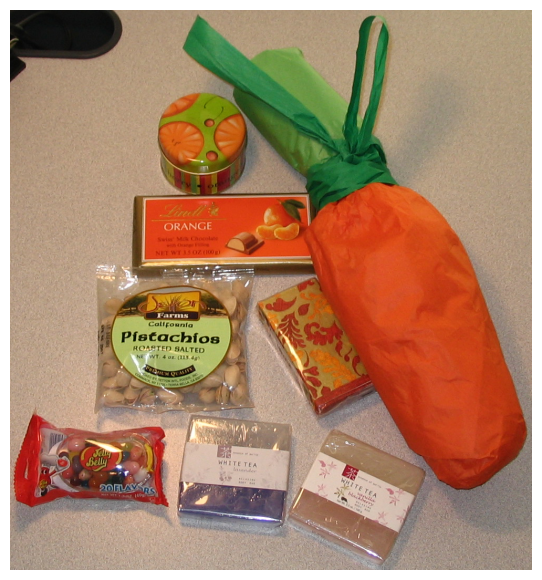 Here is another view of the Otter Case as well as all the tools and treats she sent along. 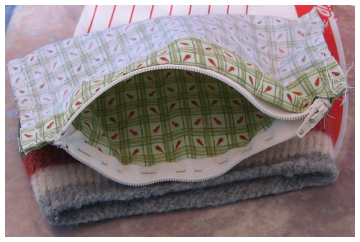 She made those cool needle holders herself and even has a post on her blog on how to make them. Very Clever this girlie! 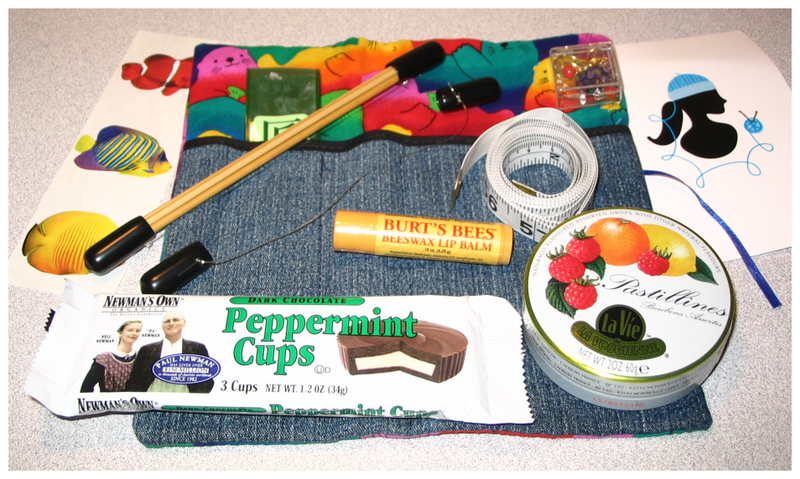 :D There are Bamboo needles, beaded stitch markers, a measuring tape, stickers, Burt's Bees Lip Balm, Peppermint cups, fruity hard candies, and a lovely personal note card. 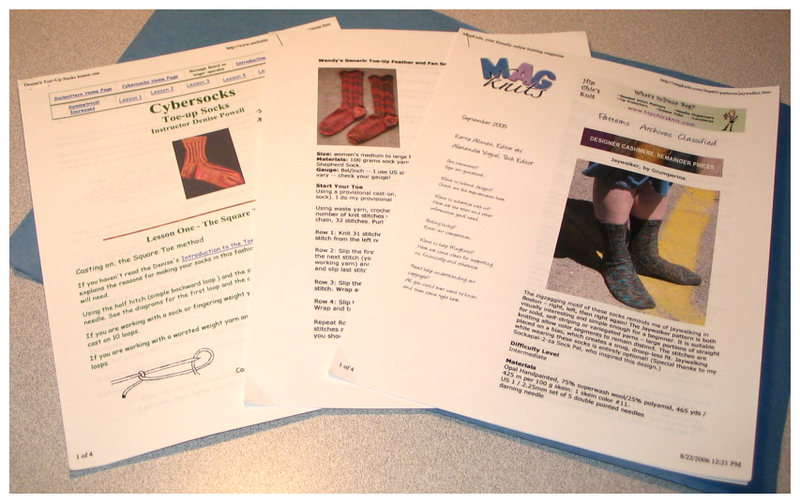 Here are the patterns she sent along with the kit: Jaywalkers and two types of Toe Up patterns. :D I can't wait to give them all a whirl. Thank you so much, sweetie. :D I really appreciate the extra effort you put into my kit. KSKS - Bunny Bag Received! I checked all my email accounts this morning and no news of a bag received or anything like that but when I checked her blog in my normal run of things I found that she had received it. :D YAY!! What a happy surprise! I'm so glad it arrived safely and that she liked it. Who IS my KSKS person you ask? Why none other than The Woolen Rabbit! Every time someone's furry people's get sick or die I start worrying. My little TKK is very old although she acts like a much younger kitty most of the time and I wish she could stay here forever. Sometimes it's almost too much. :( But the time we have with them makes it worth it and every moment counts, even if it does hurt a whole lot when that part of life comes around at the end. *sigh* Anyway back to the good stuff. 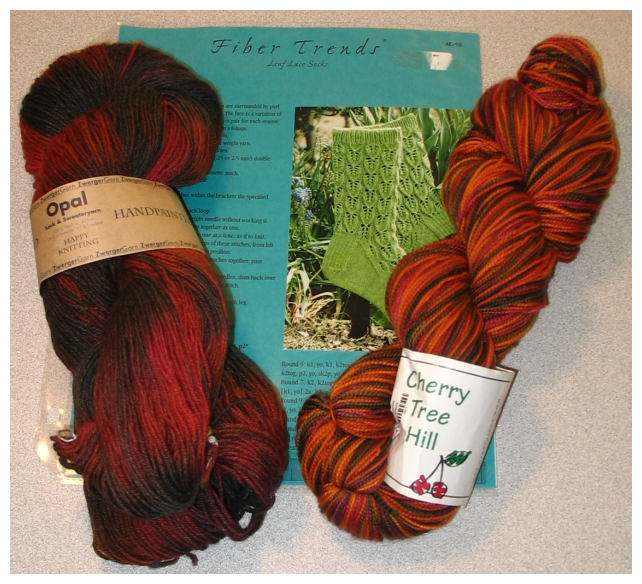 Fiber Trends Leaf Lace Sock Pattern, Opal Hand-painted and Cherry Tree Hill in flavors that I felt went with the bunny/carrot theme, as well as were in the list of her Fav Colors. 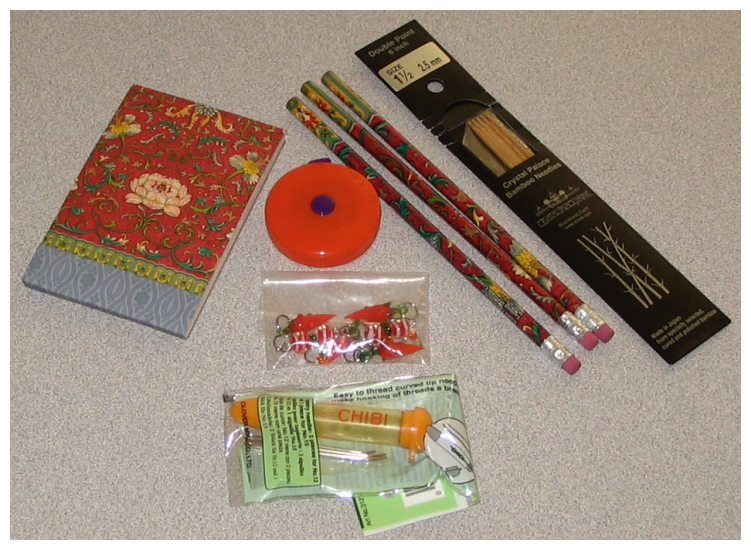 Knitting Tools for her Kit: Small Note Book, with matching Pencils, Orange Tape Measure, Orange Chibi, The Stitch Markers I made for her and a set of Crystal Palace BamBoo DPN's sized for the pattern I sent along. Not pictured in detail on this post are the Bunny Bag & Carrot Pouch as they have their own posts. 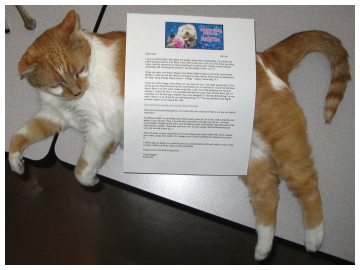 ;) To read all about their creation and the things I learned in the process you can clickie those links to read along. Yarn: Cascade 220 In Grey 8401 & White 8010 & Dalegarn Tiur (60% Mohair and 40% New Wool) In Green 7562 & Orange 3436. 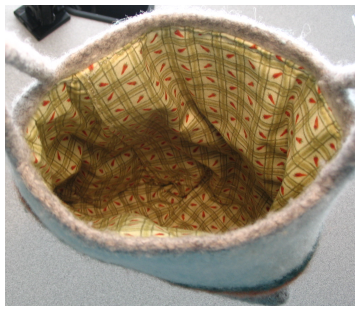 Notes: I started knitting this tool pouch on July 21 and I finished it a few days later. 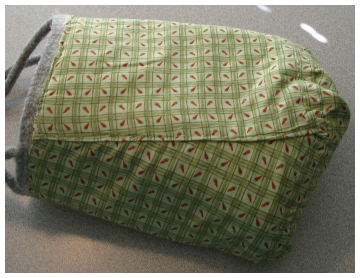 Then I let it sit until this past Saturday August 19th before I started sewing the lining and attaching the zipper. I finished last night. :D I'm muchly pleased. I knitted it up in the round like a big sock without a heal or toe decreases and then I grafted the ends together like the toes of a sock. *L* Pretty simple. Just decide what you want and find whatever way works to do it. That part was super easy and no big deal. I made the mistake of trying to hand felt it though. I figured if Hot water was good for felting REALLY hot water would be even better. All that did was make the orange yarn color run. Then I finished it off in the washing machine like a normal person. For the pouch I just figured a simple envelope fold over piece would be fine. So I measured, Ironed, cut & sewed up the lining. Leaving some overhang flaps so the part I sewed the zipper onto would be double thick. 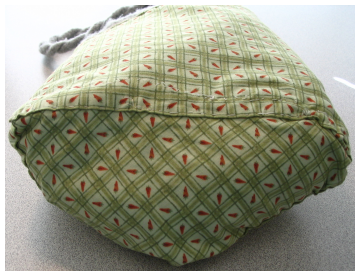 Then I sewed the zipper onto the pouch, after pinning it into place that is. Biggest lesson learned. Stop being afraid and JUST DO IT. I was so damn scared to cut the fabric and that wasn't so bad. Then I was scared to cut the zipper and that wasn't so bad. Then I was scared to sew the zipper on and that was nothing. :D Sure it's not perfect, but I tried! 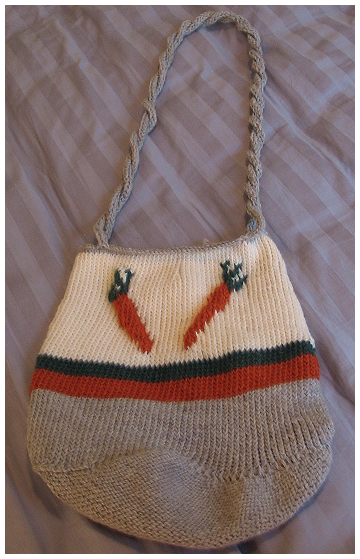 Here is the Bunny Bag & the Carrot Stripes Pouch Together! The Carrot beads are the ones Cookie was able to find for me at her LYS. :D Thank you, sweetie! What does every bunny need? A bag to hold heads in of course. :P The bag I first envisioned was going to be a Bunny Head complete with Big Bunny Ears. Yardage: Total of the four skeins I'd say I used roughly 310 yards. I have just a bit left of the white and grey Cascade and at least half of each skein of the green and orange Dale. The Dale was thinner than the Cascade so I double stranded it for knitting. Which was cool because it made the carrots be a little raised and it looks super neat. Yarn Source: Deluxe Yarns - Reno's Friendliest Yarn Source! This is the store I currently consider my Home LYS. Notes: I wanted to use my own design for this. 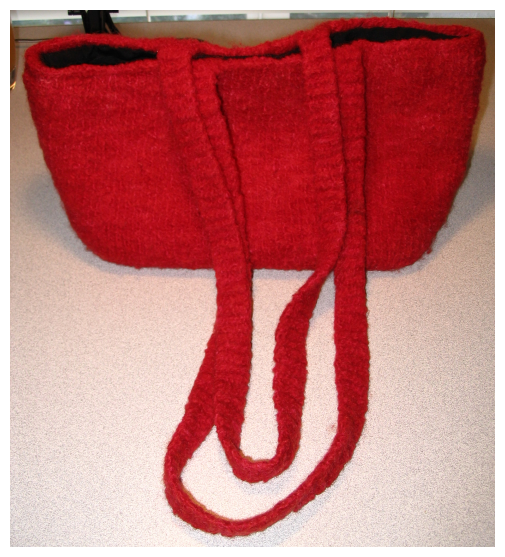 I've never knitted a bag from a pattern before, but it seemed like a good idea to jump in feet first. I've learned a lot and my next bag will be even better. :D I got the idea for how I wanted to do this from a knit bag Cookie sent me months ago so I could see what felting was like. 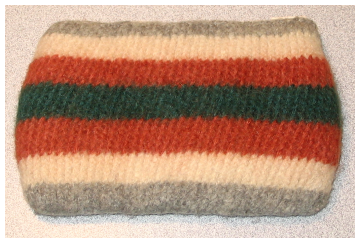 It looked like the bottom was a knit and then the stitches picked up. So I decided on a shape for my bottom piece and went from there. The shaping was a simple enough thing to reason out. I just did some simple decreases where it seemed logical for them to be. This bag has it's flaws and is by no means perfect, but it's fun and made especially for my KSKS person who I'm hoping will love it muchly. 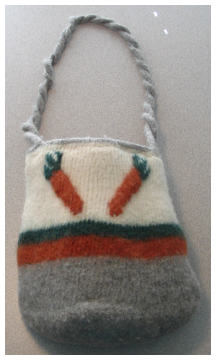 I started knitting this bag with the idea of the Bunny Head on July 4th. That's why the bag has a Triangle bottom. 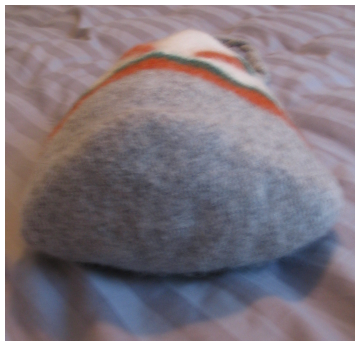 I was going to make the bag have a rounded shape with a side that was the face forward end. 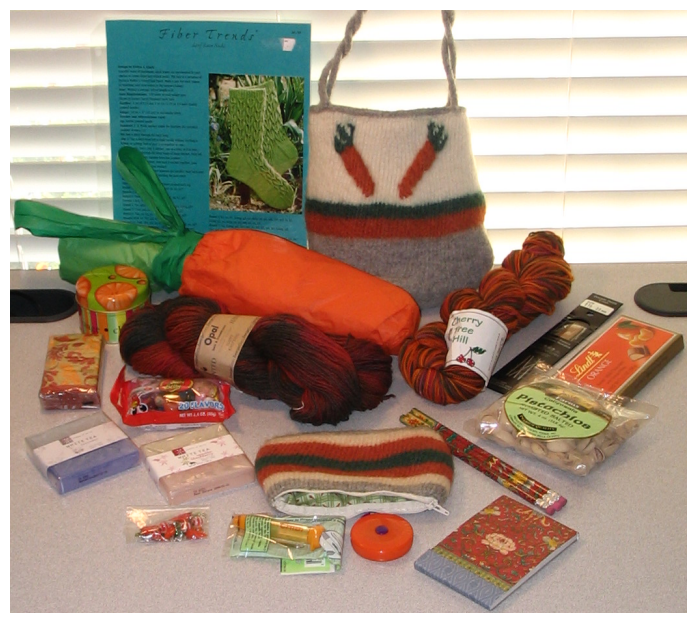 Plus it would open up the bottom of the bag with room to keep yarn and all the sock kit stuffies. Later that day it became painfully obvious that I was not going to have enough of the grey yarn to make it as I was picturing it. I wanted the bunny ears to be big and floppy and grey, a grey that was a perfect match. So the next day I went to My LYS and looked around at the Cascade. 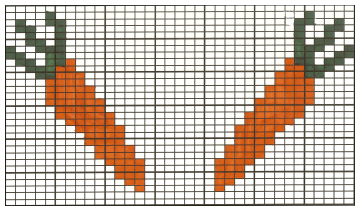 By this point I had the idea for doing Intarsia carrots in my head. They didn't have any orange though. Then I thought maybe I'd just do some embroider carrots on it with some really cool looking shiny silky cotton stuff I saw, but it wasn't really what I wanted to do and I was on a deadline to get my yarn and get out of there. I was also taking a flight in the next few days and needed to get my project stuff together so I'd have something to work on to stave of the insanity of air travel. *L* The lovely proprietor who is ALWAYS helpful and friendly asked what I was looking for and I told her, then she went to another room of the store and picked out the lovely soft Dale. :D Perfect. The store is 4 rooms of Yarn and knitting/crochet goodies, by far the biggest selection of yarn in one place here in Reno. :D Next to the orange was a perfect matching green so I grabbed those and the white cascade along with some Bobbins to help me with working with the multiple colors and headed home to finish packing and get started on the carrots. So after deciding what general shape and size I was going for I drew a few rough carrots and decided I wanted it to be a slanty carrot and not just an upright carrot. 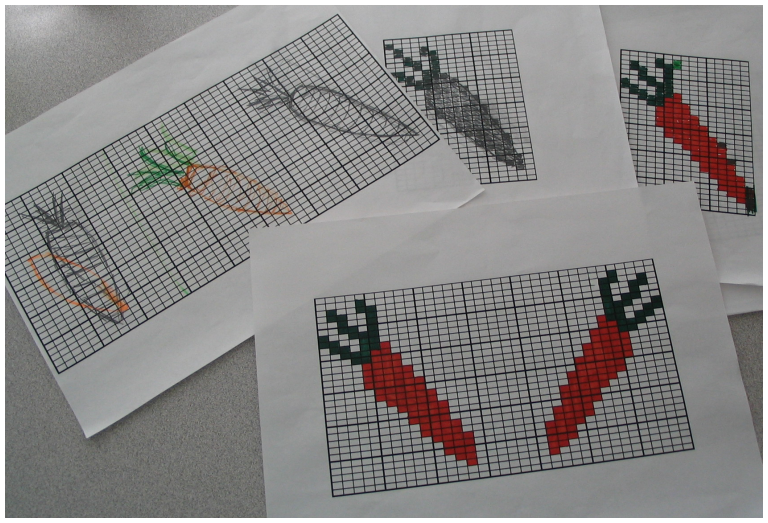 At this point I needed some knitting graph paper. So I went to Google. TO THE GOOGLE_MOBILE!!! It took surprisingly no time at all to finish the knitting portion of the bag. I was done with everything except the iCord by the time my plane landed in AnnLand. I didn't knit the week I was there, but I did go shopping at a yarn store there. *GRIN* I got some lovely sock yarn for my KSKS Person as well as some cool needles and notions and even the pattern. 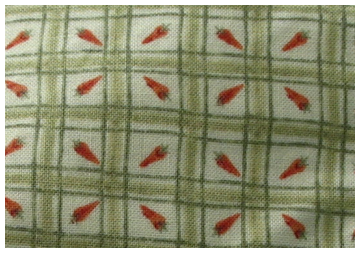 While in AnnLand I also went to a store there and FINALLY found some fabric with carrots in it. I had to go to 5 stores between Reno and AnnLand to find that stuff. None online either. o.0 Crazy! 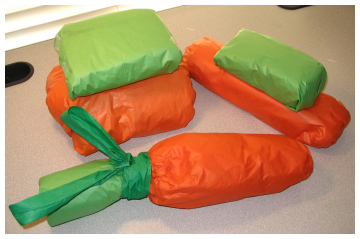 I was getting desperate at that point and was thinking I'd have to get some white or cream fabric and rubber stamps with carrots and some real dyes to make the stuff. Not Kidding. I also went to a bead store there looking for carrot beads. Nada. None here in Reno either. The lovely and talented Cookie found those in her neck of the woods for me. Three States and the Internet explored to find carrot beads. 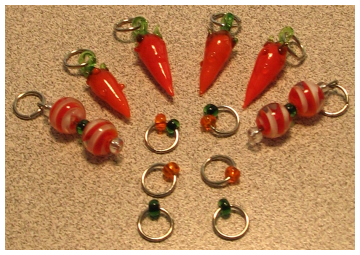 Either nobody wants carrot beads or they are rare and valuable and should be coveted at all costs. o.0 Precioussss? 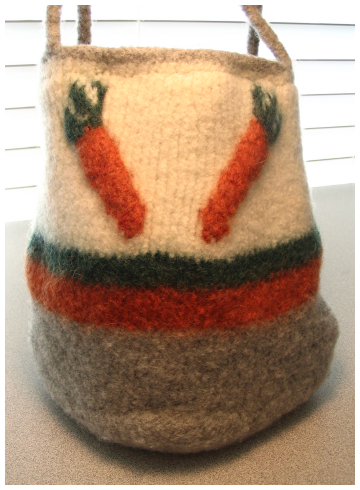 Then I let it sit for the last month as I was terrified to cut into the hard to find carrot fabric. 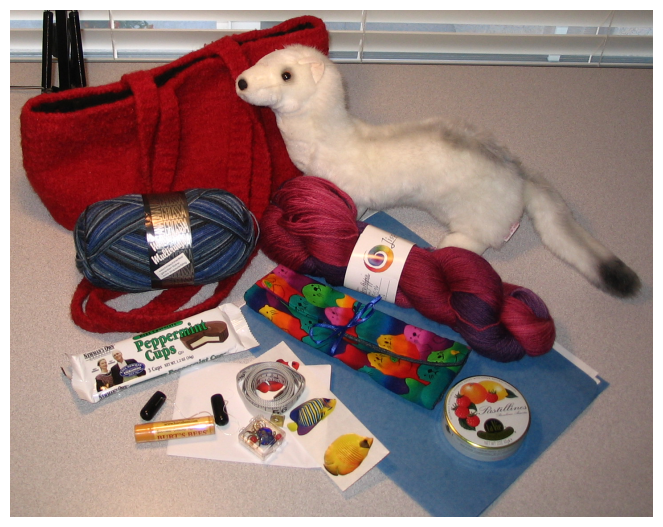 During this time to do anything but face the cutting of the fabric I started a kitty blankey and finished the socks as well as knit and hand felted a matching pouch to go with the Bunny Bag, sans carrots this time though. Just stripey. It wasn't so bad as I feared. I've never sewn anything before, well that one time in the 7th grade when they had us sew a crappy heart shaped pillow, but I never finished that... but I digress... again... so having no idea what I was doing I just did what I thought seemed reasonable. Well that and I went through anything I had that was sewn and looked at how it was done. No real help there as it was all machine sewn. I even got a book on sewing. Can you say lost? Oy. But I made it through. It's functional if not pretty. *L* I had to drop the idea of the pocket as it would have taken up too much space and made it lumpy. This bag is a lot of firsts for me. 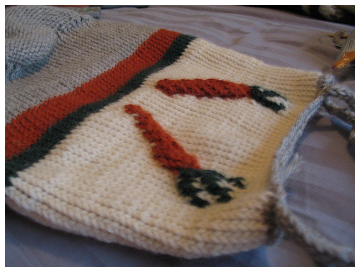 My first Intarsia (well I made a small swatch with a circle once), My first original creation, my first iCord, my first knitting with more than two colors of yarn, my first chart creation. Basically I just kinda figured it all out as I was going along. I had an image of what I wanted in my head and then I just had to make that happen. What are your favorite colors? I'm kinda all over the place on this one. *L* I like Pinks, Purples, Blues, greens... any cool mixed color combos. Where do you usually knit socks? I do most of my knitting all over the place. *L* I like to sit outside and knit. I knit in bed while I watch TV/movies. I knit at the computer and on the phone. I knit on planes or any kind of travel really. I knit in the car while the honey is driving. I knit in parking lots standing outside the car while I wait for the the honey to hurry back from getting stuff at Home Depot. *L* I knit in bars and at restaurants. I knit pretty much where I can. 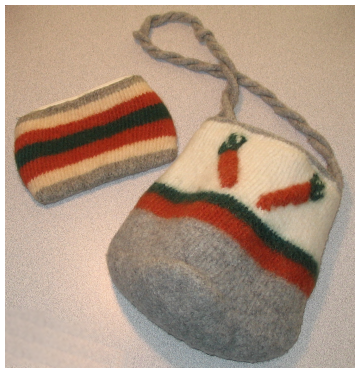 What are your favorite sock knitting techniques? I'm new so I don't really have one yet. My honey got me the book on knitting socks on two circular needles, but I haven't tried it yet. Right now I'm just doing the basic DPN's and heel flap method. Favorite kind of needles (brand, materials, straights or circs, etc)? I'm really enjoying my lattern moons, but I've heard they are weak once you get down to US size 3 and smaller. I'm wanting to try the Crystal Palace BamBoo needles when I get to the smaller sizes as I've had people tell me they last longer and have a good knit to them. I've also heard good things about Brittany so I'll likely give them a try, although I've never seen them in the smaller sizes. In general I'm happy with my Clover BamBoo needles... although I don't care for the smaller ones as they are just too bendy and I'd likely snap their little heads off. o.0 I like the wooden needles the best so far. Metal is just too slick (unless I need slick for a specific project) and the plastic ones just don't do it for me. If you were a specific kind of yarn, which brand and kind of yarn would you be? 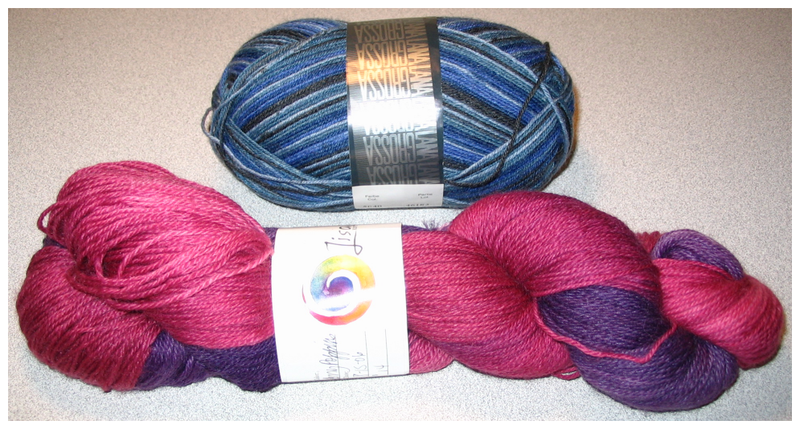 If I was a a type of yarn I would be Lorna's Laces Lion and Lamb (50% wool & 50% silk). I would be soft, yet durable, stranded with imperfections that only add to my charm and a lot of rich lustrous shine (shiny!!) that allows me to show off my beauty. I'm not made for everyone, but those that take the time to appreciate me will see what I am and enjoy me for just being me. Do you have pets? Yes. What is your most inspiring image, flower, or object in nature? Water of course. What else would you expect of an Otter. :P When I see water or am in the water I feel free. I can do anything. I can swim and just fly through the water. I am graceful. I am powerful. I am just me in my most natural form. Water, the ocean, the lake, it's all just so calming. You can finally breathe and just be. Everything melts away. All the daily nonsenses. All the heavy heartedness and the struggles. They all just melt away and in its place is left a simple peace and everything is going to be okay.